Jordan qualified as a Solicitor in April 2018. Jordan joined the firm as a Trainee Solicitor in May 2016 and qualified as a Solicitor in April 2018. Having been brought up in Pembrokeshire, she attended Milford Haven Comprehensive School and completed her A-Levels in Pembrokeshire College. She graduated from Cardiff University in 2013 with an Upper Second Class Honours in Law (2.1). After completing her degree, Jordan worked in Hugh James Solicitors in Cardiff as a paralegal in their Nursing Care department, claiming back wrongly paid care home fees from the NHS. She then moved back to Pembrokeshire and joined JCP Solicitors as a member of their Private Client department. During her time there, Jordan gained considerable experience in preparing Wills and Lasting Powers of Attorney. 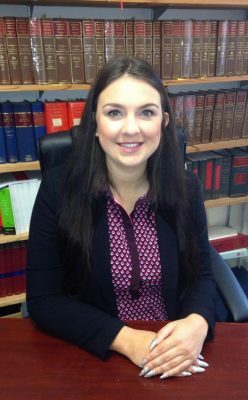 Jordan completed the Legal Practice Course (LPC) at Swansea Law School in 2017 and was awarded a Distinction. In her spare time, Jordan enjoys walking her three dogs along the Pembrokeshire coastline.